Wednesday, October 21st, 2009 at 2:12pm. Momentum in our local real estate market is continuing to build with increased activity in the late summer months of 2009. In June, the combined number of transactions among single family residences/duplexes, condos/townhomes and land was at 55. After closing the month of September, this number has more than doubled with 117 sales. Data for the past 45 days indicates even greater activity on the horizon with 161 pending sales. 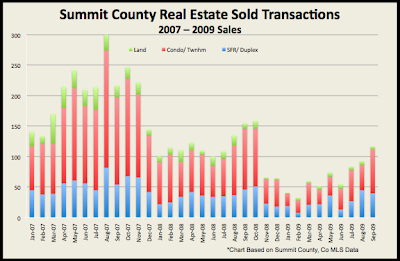 The first graph below highlights the lows of early 2009 as well as the upswing in transactions experienced over recent months. 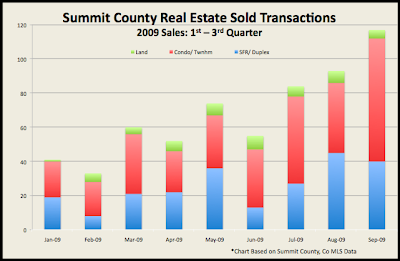 The second graph shows the sold data since 2007. Tuesday, October 20th, 2009 at 3:03pm. Learn what's planned for the local ski areas this winter at the annual season preview event featuring top executives from each local resort. Ski resort representatives from A-Basin Ski Area's VP and COO Alan Henceroth, Breckenridge Ski Resort's Director of Mountain Operations Gary Shimanowitz, Copper Mountain Ski Resort's President and COO Gary Rodgers, Keystone Resort's VP of Mountain Operations Doug Lovell and Loveland Ski Area's Director of Business Operations Rob Goodell, will address the public and officially kick off the 2009-2010 season. The event is scheduled for tomorrow, Wednesday, October 21, from 7-9pm at the Community & Senior Center in Frisco. Wednesday, October 7th, 2009 at 1:14pm. Loveland Ski Area announced yesterday it would open today - its earliest opening in 40 years! The ski area, located 50 minutes west of Denver, starting running lifts this morning at 9am and is the first resort in the state to open. The ski area opens with only one run, but it's a great sunny day today and a perfect way to break in the ski legs for the winter ahead. Loveland has been making snow since September 21 and has tree to tree coverage with an 18 inch base. Conditions are looking good for early season. Wednesday, September 23rd, 2009 at 2:58pm. It's been snowing off and on the past couple of days in Breckenridge, Colorado. It's typical we'd get some snow in town in the Fall sometime during the month of September, but we're wondering if Old Man Winter is making his entrance early or if we will truly get to enjoy a little bit of fall. Snowcapped peaks and golden changing Aspens in the background make it the perfect time to cozy up at home around the fireplace and read a book. It's nice to have days like this in Breckenridge and with all the talk about what an epic winter it's going to be, we can't help but get excited for more. Here's a photo from this morning of the snow covered peaks of Breckenridge Ski Resort. The count down until opening day begins! Monday, September 21st, 2009 at 3:08pm. Earlier in the month, we emailed our clients and friends with our "Secret Stash" recommendation - our local's secret and something not to miss in Breckenridge, Colorado. Our "Secret Stash" for the week was the beautiful changing Aspens at their peak on Boreas Pass. We hope you were able to check it out. We have been up there several times this fall and this weekend was beautiful. Get up there in the next few days if you haven't already, or the leaves will have fallen and you might have to wait until next year. Wednesday, September 16th, 2009 at 12:41pm. Breckenridge Associates Real Estate is a proud supporter of The Summit Foundation, a non-profit organization in the mountains that through annual fundraising efforts gives back to the local community. Since 1986, The Summit Foundation has awarded more than $10.6 million in grants - distributed to 218 nonprofit organizations. Also, more than $1 million has been distributed in scholarships to students pursuing post-secondary education. Visit this link to learn more about The Summit Foundation. Thursday, September 10th, 2009 at 12:09pm. What Does Old Man Winter Have In Store For Breckenridge? Thursday, September 10th, 2009 at 12:01pm. Winter is just around the corner and we’re wondering what it might bring. Each year we hope for endless snow. Will Mother Nature deliver this year? We’ve reviewed weather predictions from two separate, century-old forecasting methods - the Farmers’ Almanac and Weather Folklore. There are some interesting insights from both and if they're right, it could be a big Winter. Hint, hint…shoveling may be in your future. Thursday, September 10th, 2009 at 11:58am. You won't want to miss an opportunity to view "Colorado Gold" in Summit County. And, there's no better way to experience it than enjoying a family mountain bike ride on moderate singletrack to Bakers Tank at one of the best fall foliage viewing places, Boreas Pass Road in Breckenridge, Colorado. Thursday, September 10th, 2009 at 11:54am. Season ski passes on sale now! With so many resorts to choose from and easy access to and from Summit County, you can’t go wrong. We’ve included pass pricing from many ski resorts: Breckenridge, Keystone, ABasin, Vail, Beaver Creek, Copper Mountain, Winter Park, Steamboat and Loveland.